Dental implants can be fitted for a number of reasons and can be used to replace one or multiple missing teeth, lost as a result of rotting or breakage in an accident. Dental implants are a practical alternative to removable dentures as once fitted, the patient doesn’t have to worry about regular removal as the replacement teeth are clipped onto the stud-like implants that are inserted during the treatment. 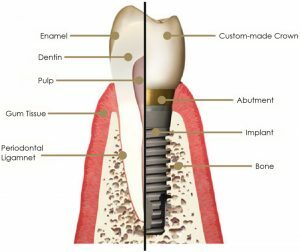 Dental implants are made up of titanium alloy and a custom-made crown. The implant is the part that is inserted into the jaw bone that acts as the tooth’s root, and the crown is the white part on the surface of the gum that is designed to look like the replacement tooth (see below image). Titanium is used because it fuses with the bone and as a result creates a stable base for the tooth or teeth. It is also biologically safe so will easily be accepted by the body. Depending on the number of teeth that need replacing, you may be offered an implant bridge by your dentist. The difference between the two is that singular implants can replace individual teeth, and a dental bridge can replace up to fourteen teeth; the number of implants required varies based on the number of teeth within the bridge (e.g. 2 implants are needed to replace 3 or 4 teeth, but 6 to 8 implants are needed to replace 12-14 teeth). A concern many people have is whether the dental implants look real and whether others would be able to see that they have had them fitted. Fortunately, Dr Tom Donnelly, our resident implant dentist is highly skilled and experienced in dental implantology and strives to give his patients beautiful and functional smiles. Each replacement tooth will be expertly moulded to the appropriate shape and size for your mouth, and the colour of your existing teeth will be analysed carefully to ensure as close a colour match as possible. 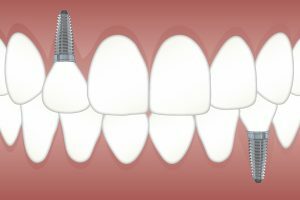 We have a number of case studies on the website that demonstrate our dental implant treatment with various different techniques. The decision to have dental implant treatment is a big one, but the results can be life-changing. When done well, dental implants will look and work exactly as your natural teeth would, so you can restore your smile and your confidence. For Banbury dental implants, look no further than The Implant Studio. Dental implants create an excellent replacement for your natural teeth, and are designed to work with your existing teeth seamlessly. The professional team at The Implant Studio will work with you to get you the results you want. Interested? Book your dental implant consultation today. The Implant Studio will have you smiling again in no time.